Posted on September 22, 2017 at 6:49 pm. 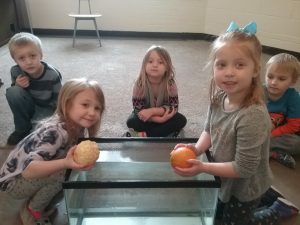 This week in our classroom, we learned All About Apples! The students enjoyed learning about the life cycle of the apple. 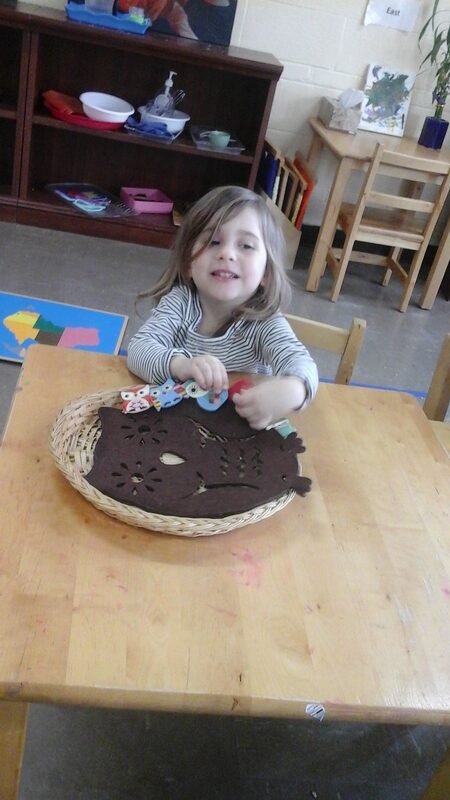 We discovered apples are ripe in the Fall, and apple trees sprout beautiful flowers in the Spring! We also discussed different things that can be made from apples and the names of the different parts of the apple. Working on the Parts of The Apple work together using three part cards! Proud of her work! This student used the chalkboard to to practice writing the letter “H”. Proud of his work using the Metal Insets! 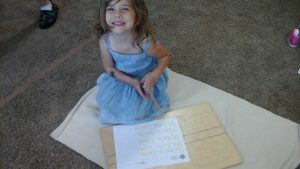 This material is designed to aid the child in steadying their hand for handwriting! -What do community helpers do for us? -How do we call 911? -Learning French with Ms. Mel! Posted on September 15, 2017 at 2:17 pm. 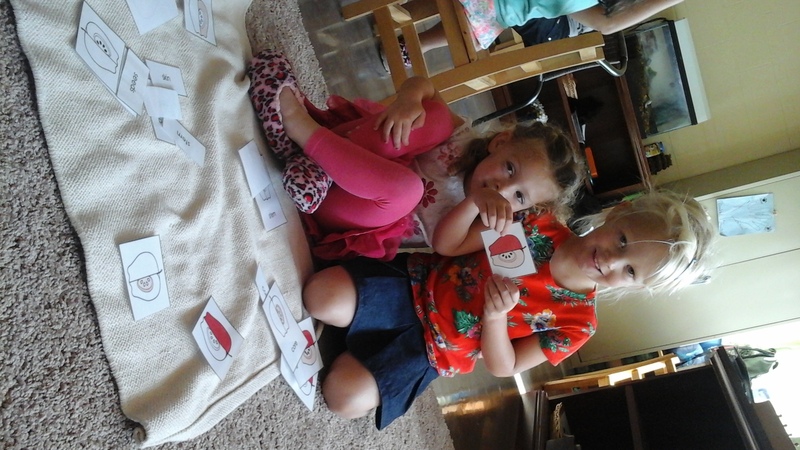 This week we learned all about each other! 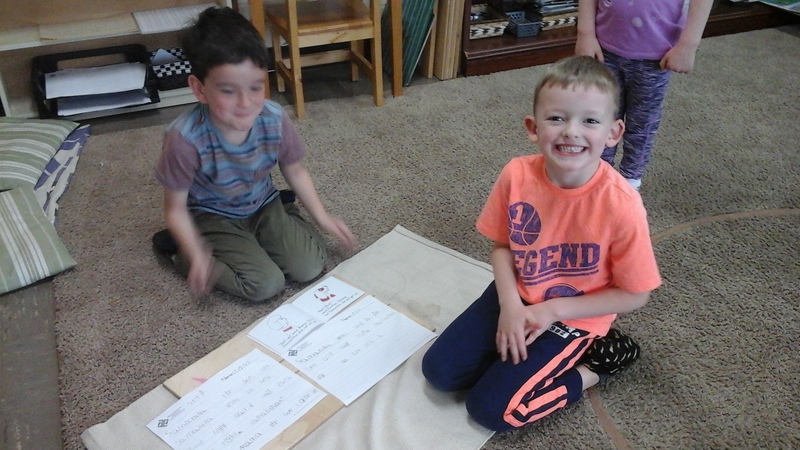 We discussed what makes each of us unique and special, we played a “Baby Picture Guessing Game”, and we practiced saying our full names. 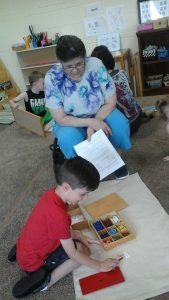 The children also enjoyed learning several Japanese words and phrases with Ms. Mel during our afternoon group times with preschool students. 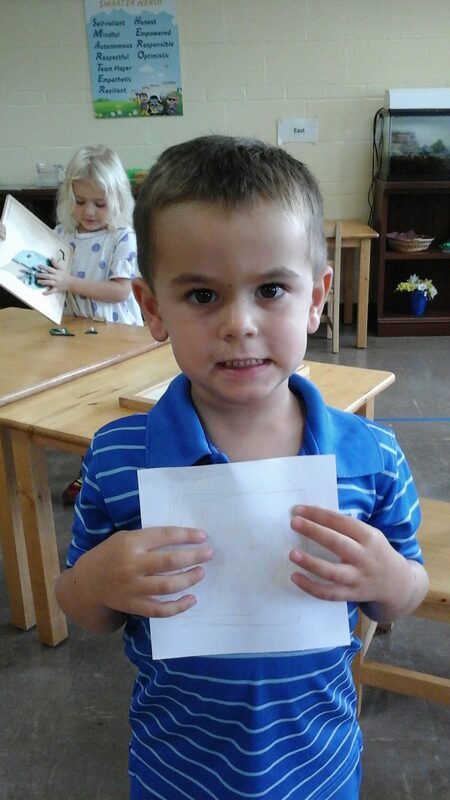 This little one is proud of his work on the snap frame! This material is part of the Practical Life area of the classroom. It aides the child in developing their senses of order, concentration, coordination, and independence. 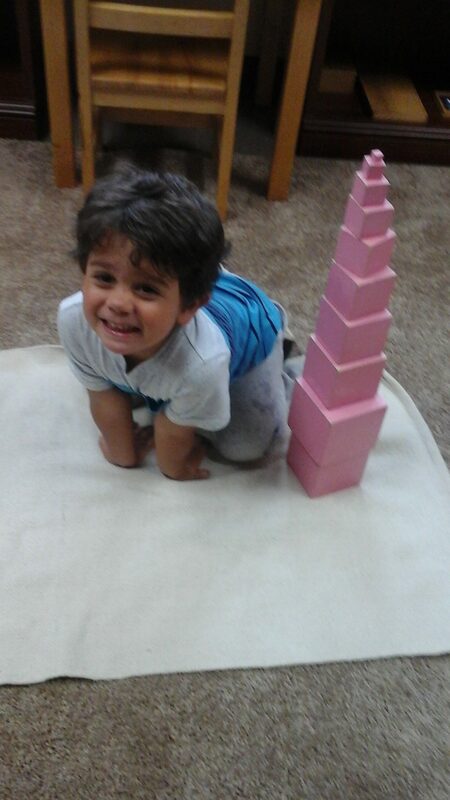 Proud of his work on the Pink Tower! 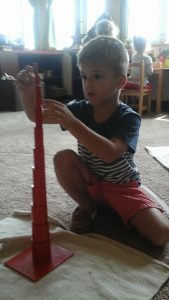 The child builds the tower from largest to smallest. 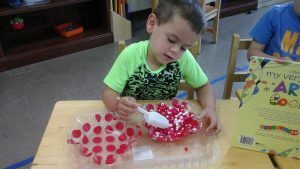 This material is part of our Sensorial curriculum and aids in the preparation for Math. 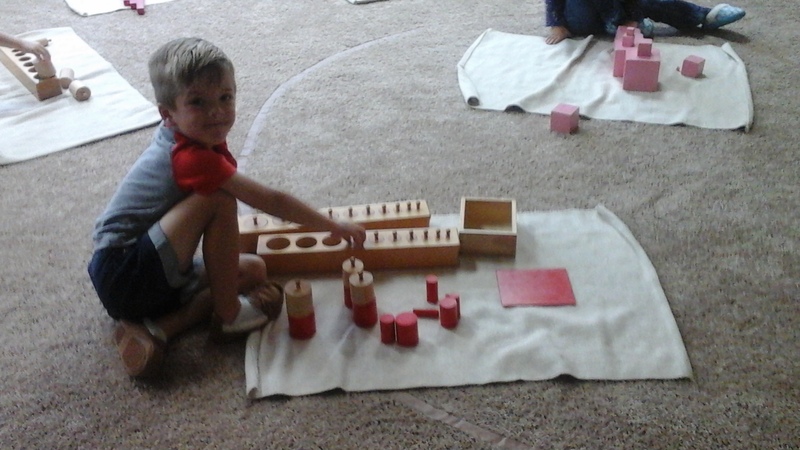 Working with the Knobbed Cylinders and Red Knobless Cylinders! Both of these materials are found in the Sensorial Area. 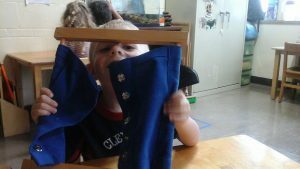 They help to develop the child’s pincer grip and are indirect preparation for Math. A Peek Into Next Week: All about Apples! Hearing the story “Little Bear’s Star”. 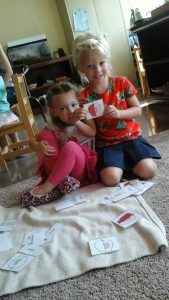 Learning about the parts of the Apple. Posted on September 8, 2017 at 3:30 pm. 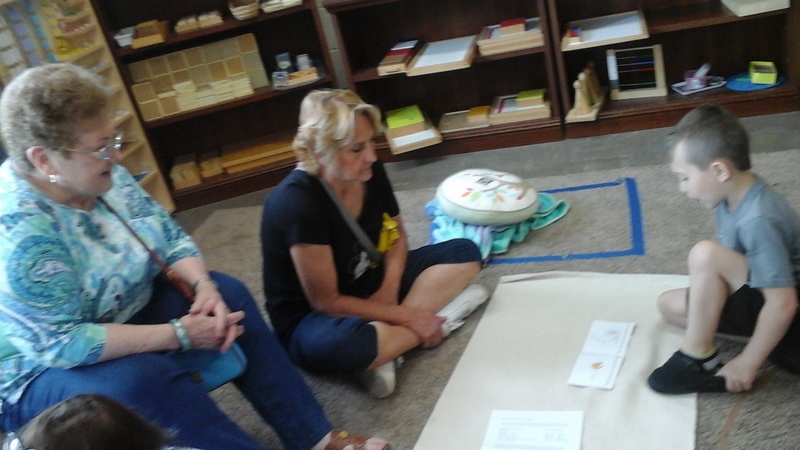 This week we continued our introduction to Ground Rules and Grace and Courtesy. 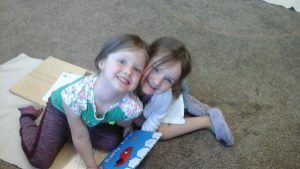 The children are becoming more and more comfortable in the classroom and are quickly making friends! 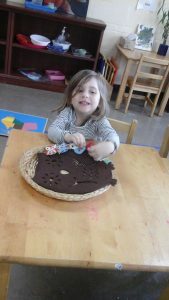 Our work periods are becoming a little longer and the children’s concentration and independence is growing more every day! 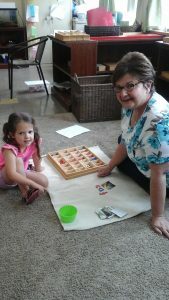 The children also enjoyed learning a few words in Chinese with Ms. Mel during Pre-School Afternoon Group Time! Working on the Introduction to The Golden Beads! 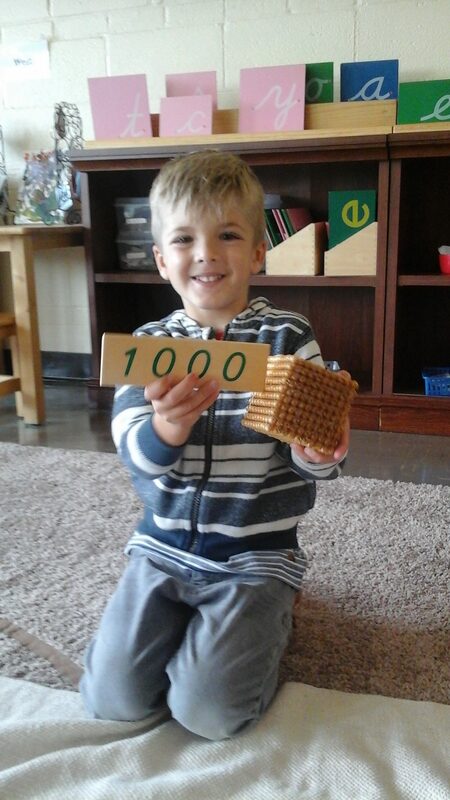 This material gives the child and introduction to place values and numbers and quatities beyond 10! 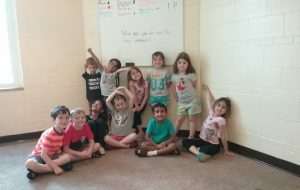 Ms. Mel taught the children how to say “Hello” and the words for “Mom”, “Dad”, and “Baby”. 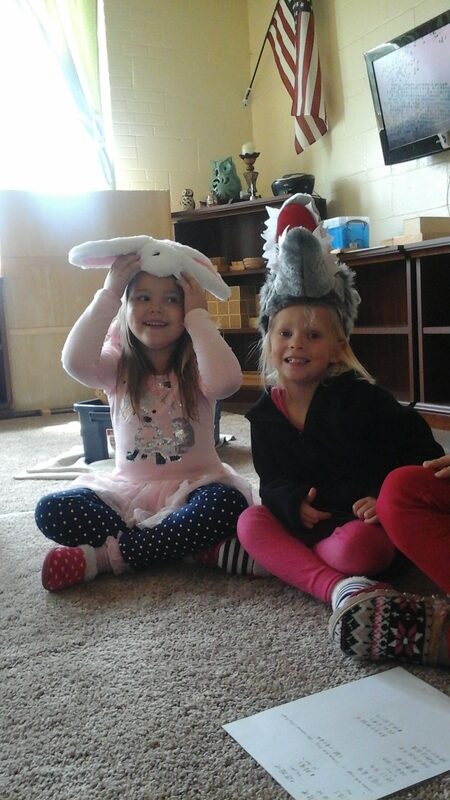 She also read the children a story about three little bunnies and a wolf in Chinese and had the children act it out during work time! Practicing pouring! 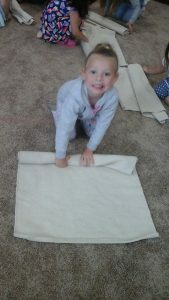 Like many Practical Life materials, the child pours the material from left to right, which will indirectly prepare them for reading. -Discussing what makes each of us special: hair color, eye color, likes and dislikes, our birthdays, our names, our emotions, etc. Posted on September 1, 2017 at 2:57 pm. This week in our classroom was wonderful! We spent much time together exploring the classroom and the building, learning classroom rules, learning all about grace and courtesy, all about kindness and manners, and Ms. Mel even shared with us a little bit about South Korea! Ms. Mel and I have also enjoyed getting to know all of our new students and reconnecting with our returning friends! Working on the Red Knobless Cylinders! 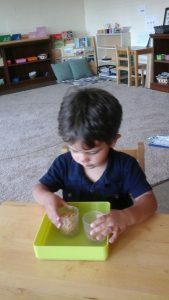 This material helps the child learn to build their sense of order and concentration. 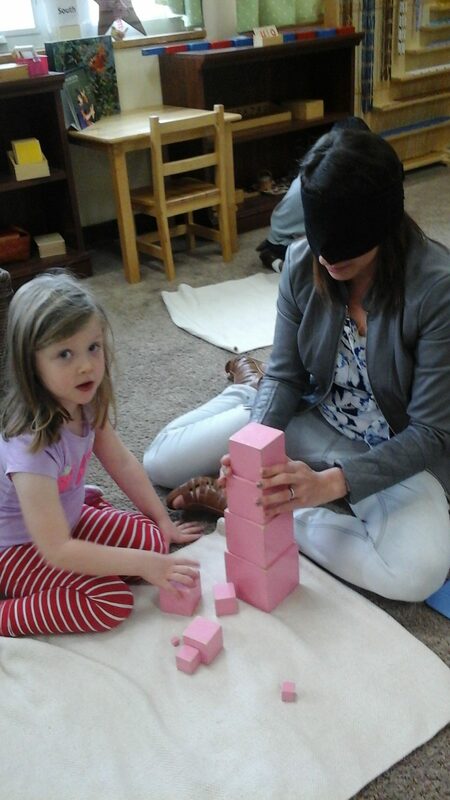 In addition, the child learns to build from thickest piece to the thinest piece and strengthens their pincer grip. 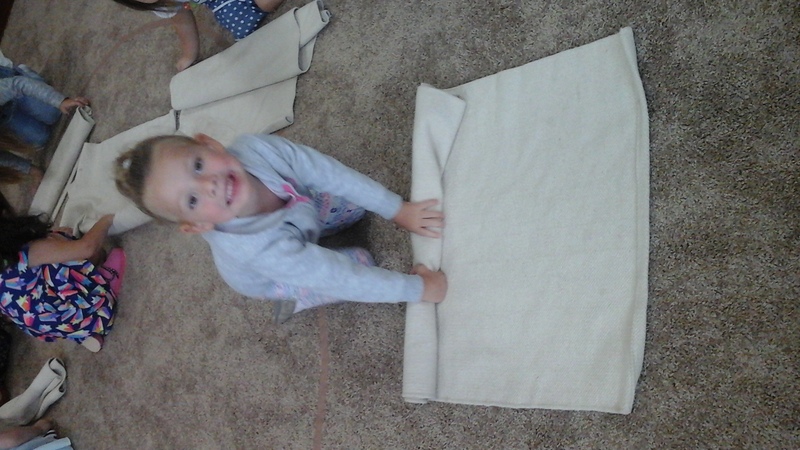 Learning to roll a rug neatly! 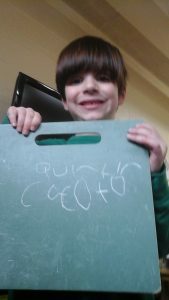 The children have been learning to take care of our classroom and to take responsibilty for cleaning up their own work. Ms. Mel showing some preschool students the continent where her homeland of Korea is located. She also taught them how to say “hello” in Korean and how to sing “Baby Shark” in Korean as well! -Continue going over Ground Rules. -Making a list of Classroom Rules together. 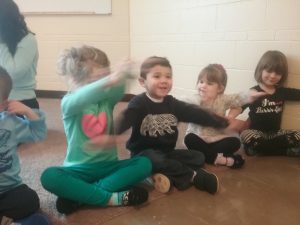 -Learning songs to remind us when to say ” Please” and “Thank You” and “Excuse Me”. REMINDER: NO SCHOOL this Monday for Labor Day! Posted on June 7, 2017 at 4:33 pm. Audrey enjoying the Button Sorting work, which aides the child in developing their sense of order. 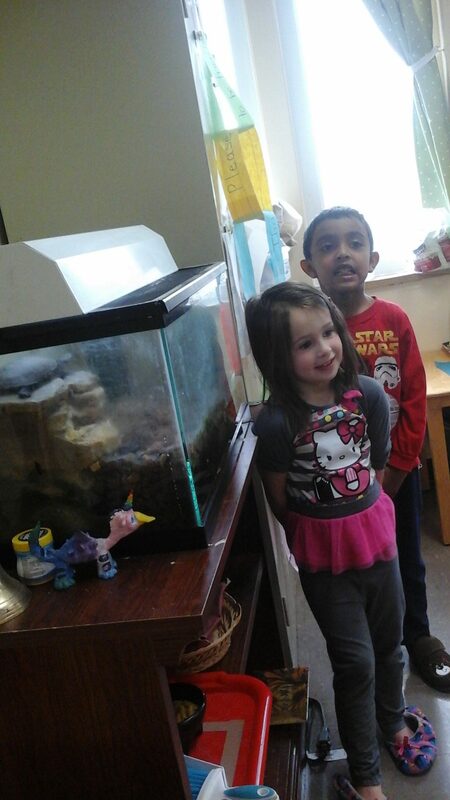 During the first week, we discussed all about Insects. We learned that insects have six legs. We also learned that all insects have a head, thorax, and abdomen. We also learned about the process that caterpillars go through in order to become a butterfly, called metamorphosis. 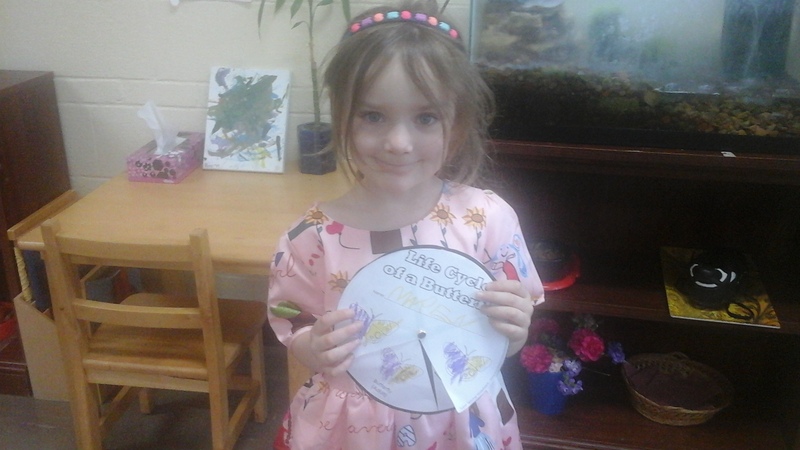 The children also enjoyed making their own time line of the process of metamorphosis as well during work time! We also enjoyed watching our very own caterpillars, donated by Tenleigh’s family, go through the process of metamorphosis! 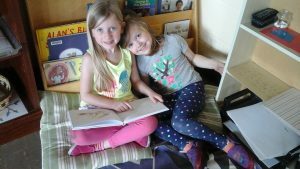 Hali and Maren, enjoying copy writing from a book! 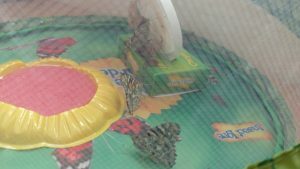 Our beautiful butterflies! Our little baby birds in a nest at the Akron Zoo! 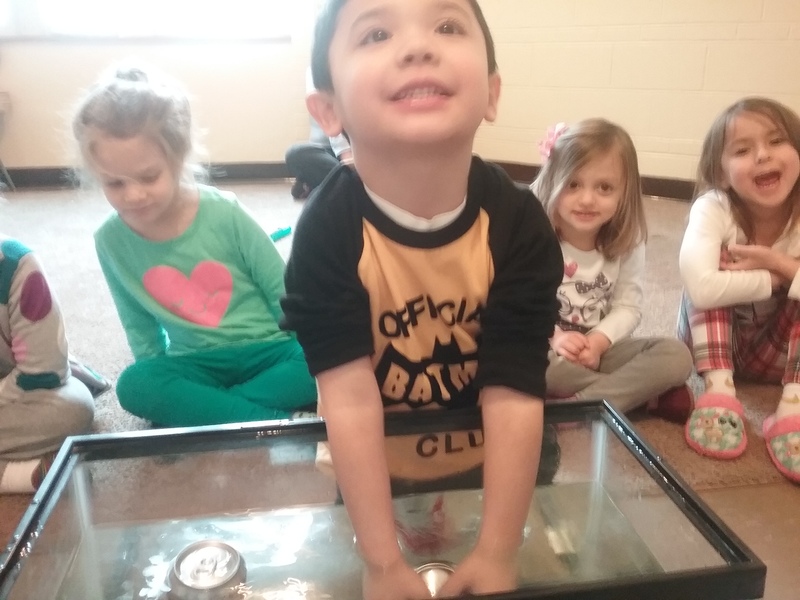 The following week we learned all about Dinosaurs. The children learned that there were some dinosaurs that ate meat (carnivores), some dinosaurs who ate plants (herbivores), and some dinosaurs who ate both plants and meat (omnivores). 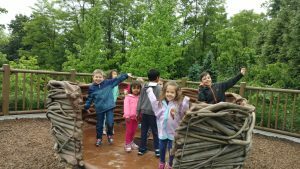 We learned also learned that Dinosaurs were reptiles. The children also learned all about Tyrannosaurus Rex and that his name means “ Tyrant Lizard King”. We also learned that a scientist who studies dinosaurs is a Paleontologist. Victoria practicing writing her name! Liam working on the Subtraction Charts! Mammals were the topic of discussion during week four. The children learned that mammals are warm blooded, give birth to their babies, usually have hair or fur on their bodies, and they drink milk from their mother’s bodies. We also learned that we humans are mammals as well. We enjoyed having our grandparents come to visit us for Grandparents Day! 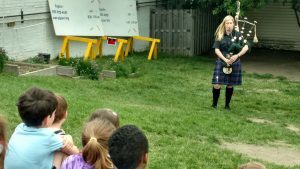 The last week of school was all about Summer Fun and Safety. Ms. Caroline made bracelets with the children that had their phone numbers on them. We also learned that we should wear our helmets when riding our bikes or skate boards, when it is ok to call 911, that we should not talk to strangers, and what is safe to touch in our house and what is not, for example not to mess with the AC and live professionals from http://heatingairpros.com/riverside/, to handle it if something get broke. We also briefly discussed birds and the characteristics of birds. Bennett working on the Scooping Work, which aides the child in developing their sense of concentration and order! This summer, I encourage to you discuss with your child the safety rules of your home and rules for also being safe in your neighborhood. Take time to read the security systems blog at securityinfo.com as so that you’ll know The Best Local Security Installer In Your Area. For more tips, reach their team at info@securityinfo.com or give this number a call (786) 800-2609. 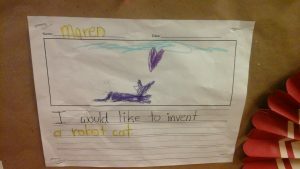 Discuss with your child what their favorite animal was that they saw at the zoo. Take a trip to the Natural History Museum in Cleveland and see the Tyrannosaurus Rex skeleton up close. Samantha’s mom came to play the bagpipes for us! What a treat! Posted on May 9, 2017 at 6:02 pm. The month of April was fill with international fun! Our classroom represented Africa in the International Festival. The children really enjoyed diving in and learning all sorts of details about the countries and cultures of Africa! The children also enjoyed learning about Spring and how to recognize the signs of Spring. 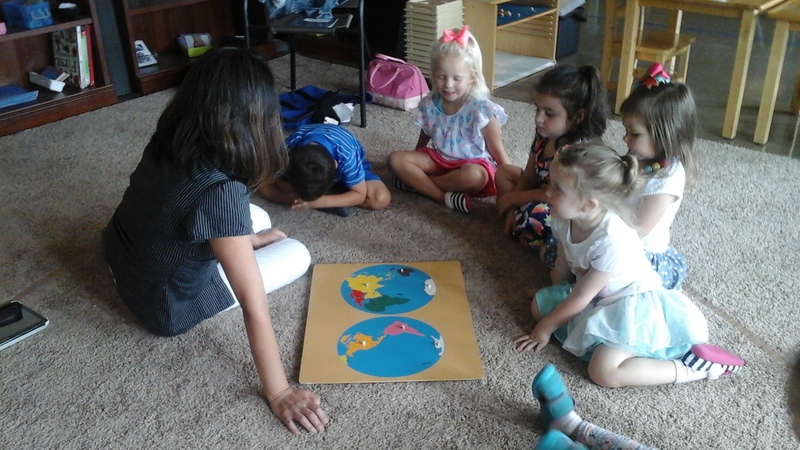 During the first week, we learned the Montessori Continent Song in order learn the names of all the continents of the world. 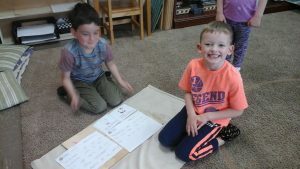 The children also began to dive in to the map puzzles in more detail and began to learn more about each continent. We also discussed how far Africa is from the United States and how if we wanted to travel there, we would have to take an airplane or a boat. The children also enjoyed making African animal puppets with Ms. Caroline. We also began working on our African drums for the festival as well! We continued our study of Africa during week two. The children learned all about how in Ancient Egypt, the pyramids were built as tombs and that the Ancient Egyptians believed they could take their belongings with them to the afterlife, so they packed their pyramids full of their belongings. Ms. Caroline brought in some stuffed animals and toilet paper and the children enjoyed wrapping up their own mummies. We also learned real mummies that are in museums are not scary. The children also learned about Morocco and learned that Moroccans love to drink mint tea! During our final week of study of Africa, the children learned about Zimbabwe. We learned that Zimbabwe does not have it’s own currency. We also learned that many people in Zimbabwe believe Mermaids exist. The children enjoyed designing their own ideas of what a new Zimbabwe currency might be during Afternoon Group Time as well. 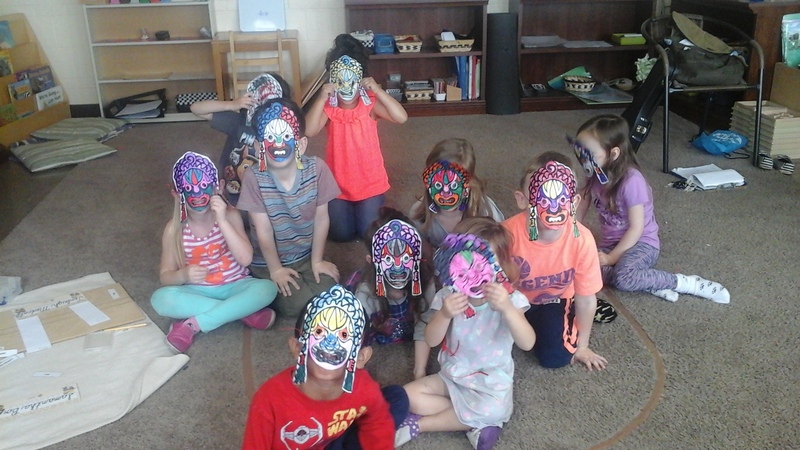 The children also enjoyed making African masks with Ms. Caroline during Afternoon Group Time! During the final week of April, we learned all about Spring. We learned that Spring is a time for new life and that many animals are born in the Spring such as geese and lambs. The children also enjoyed watching a video clip of a real baby chick hatching from and egg! We also learning some songs about Spring as we sang along with my ukulele. Some things you can do with your child in the coming months to reinforce our themes would be going to the Zoo and seeing how many animals your family can find that are from Africa. Try making an African dish for dinner one evening. Pull out a world map and review the names of the Continents together. Discuss with your child their favorite country from Africa. This month in handwriting, we have continued to focus on forming complete sentences. The Kindergarten students also enjoyed correcting my capitalization “mistakes” in example sentences. 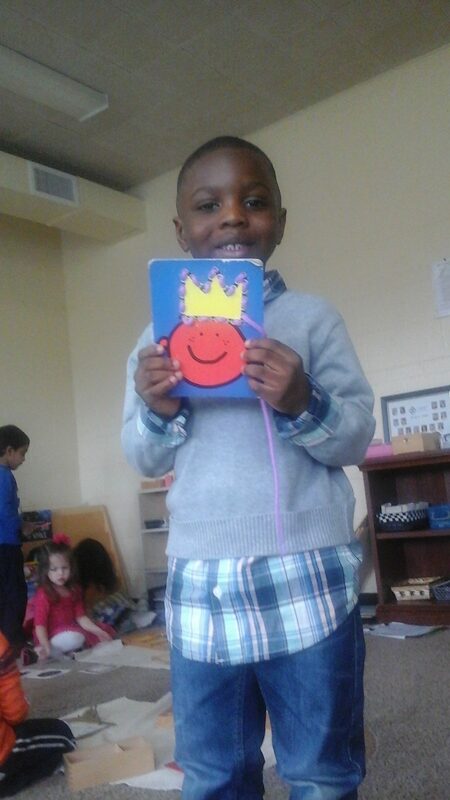 We continued journaling together. 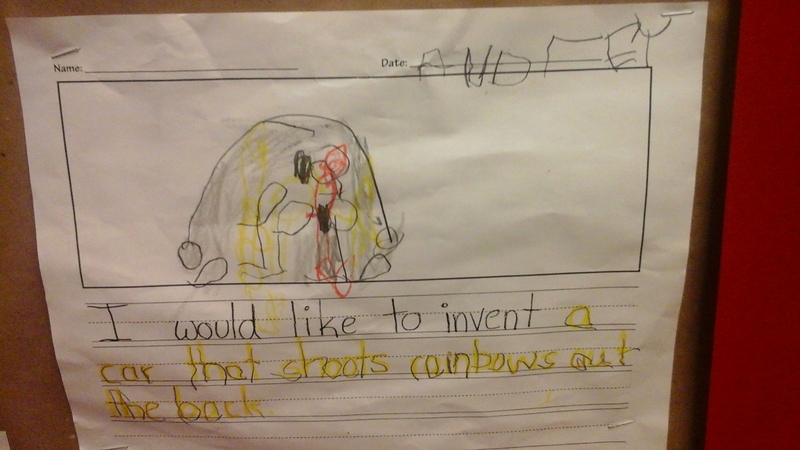 Our kindergarten students continue to impress me with their handwriting and creativity! Posted on May 1, 2017 at 8:01 pm. Learning all about birds and the parts of the bird, what they eat, etc. Discuss summer safety rules for your family with your child, such as where is safe to play in your neighborhood, what to do if approached by a stranger, etc. Posted on April 4, 2017 at 6:20 pm. The month of March has been very busy in our classroom. We learned about Dr. Seuss, Space, and all about our state of Ohio. 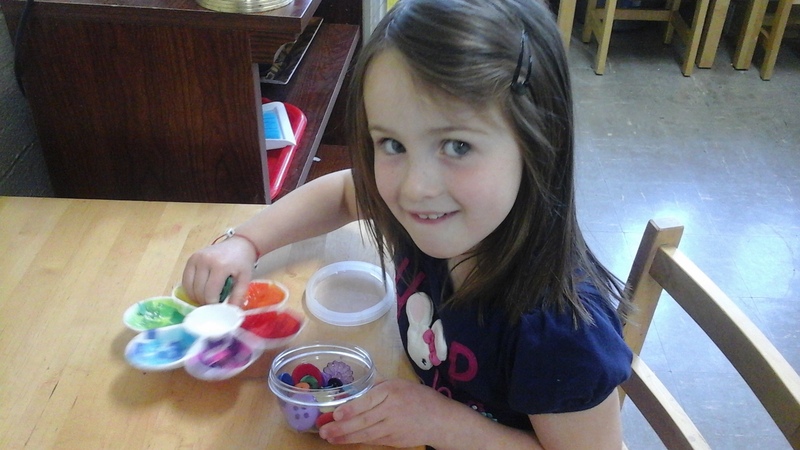 The children also enjoyed celebrating St. Patrick’s Day! We were also very excited to welcome Ms. Caroline to our classroom! 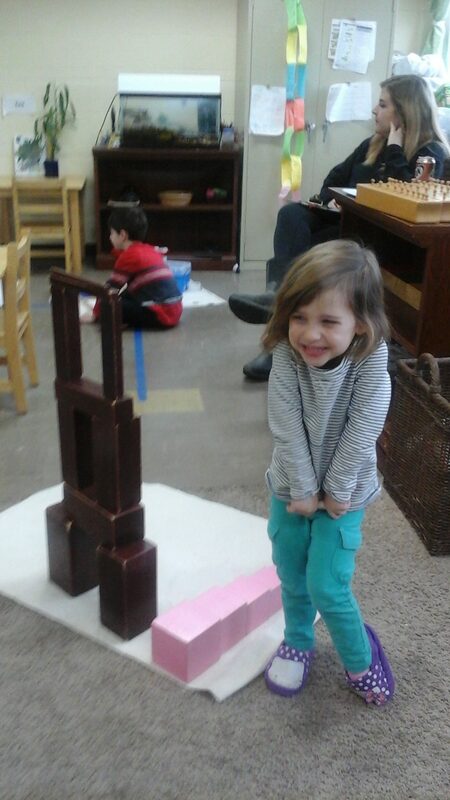 Victoria was so proud of her work with the Pink Tower and Brown Stairs! This material helps the child to develop a sense of order as they build from the biggest to smallest piece. 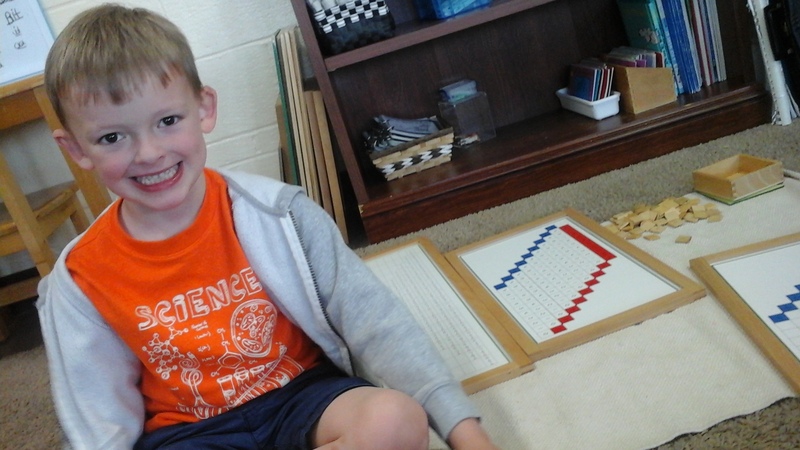 It’s also great preparation for the Math area! During the first week, we had fun learning all about Dr. Seuss. 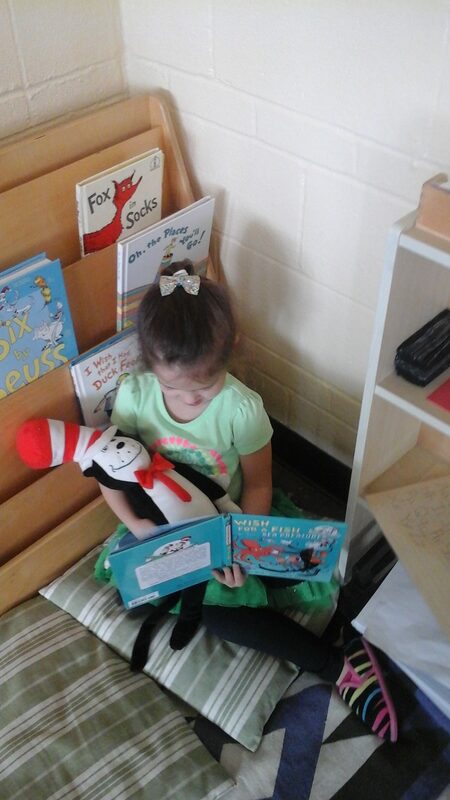 The children enjoyed reading “ Yurtle The Turtle”, “ The Cat In The Hat” , and “ Fox In Sox”. 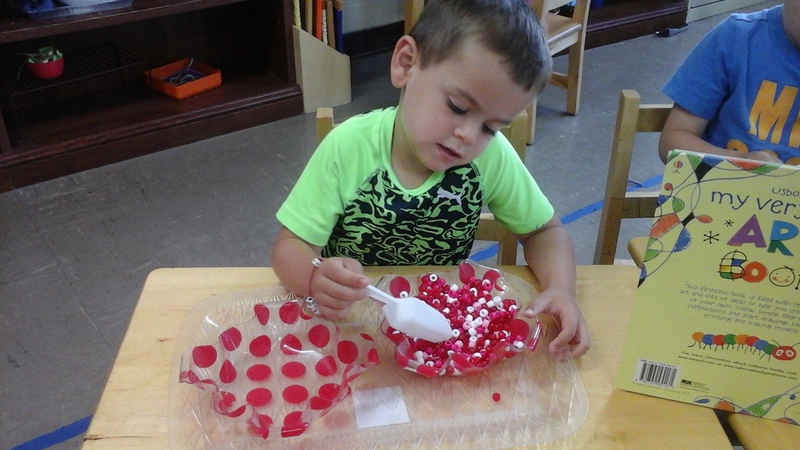 During Afternoon Group Time, the children enjoyed making Cat In The Hat hats with Ms. Kerri. The children also learned that Dr. Seuss’ real name was Theodore Seuss Giesel and he wasn’t actually a real doctor. We also learned that Dr. Seuss lived near a zoo as a child, which is where he began to think of all of his imaginary creatures in his stories! The children also taste tested Green Eggs. Tenleigh enjoying a Dr. Seuss book in the Library while snuggling the Cat In The Hat. During week two and three, we enjoyed learning all about Outer Space. The children enjoyed learning all the names of the planets in our solar system, learning all about the phases of the moon, and all about constellations. The children also enjoyed watching footage of the first moon landing. They learned about black holes with Ms. Caroline and learned a Planet Song with Ms. Kristen! 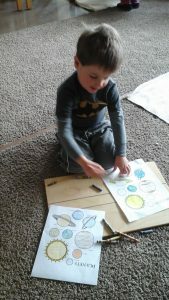 Some of the children even took it upon themselves to make their own book of planets! We also were pleased to welcome Ms. Caroline to our classroom! Ms. Caroline introduced herself to the children by bringing in pictures of her and her family and sharing with us how they moved here from England! We are so thankful to have her as a part of our classroom and the children are so excited she is with us! 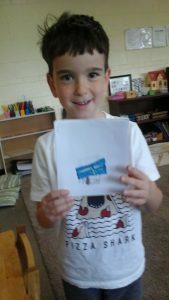 We learned all about Ohio during week four! The children learned our state bird, the Cardinal. We also learned that our state capitol is Columbus, and that our state tree is the buckeye tree. We also talked about how our state is a small piece of our country, that our county is a small piece of our state, and our city is a small piece of our county! The children enjoyed seeing this up close using Google Earth to zoom in on our school with Ms. Caroline! We also enjoyed talking about famous sites around Ohio, such as Cedar Point, Progressive Field, The Cuyahoga Falls Clock Tower, etc. 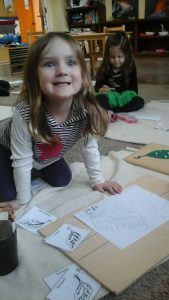 For St. Patrick’s Day, the children enjoyed making a shamrock craft with Ms. Caroline and learning about how St. Patrick’s Day became a holiday! 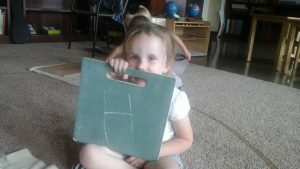 I would encourage you to review with your child what they have learned this past month. Read a Dr. Seuss book together and ask your child to point out some of the rhyming words. Discuss with your child the name of our planet, continent, county, state, and city. Practice naming the planets together and discuss which one you and your child would visit if you could. Posted on April 4, 2017 at 3:48 pm. The location of the continents on the globe. Using the Continent Map Puzzle to locate the continents. Where is Africa? What is the weather like in Africa? Landmarks and Animals that are indigenous to Africa. 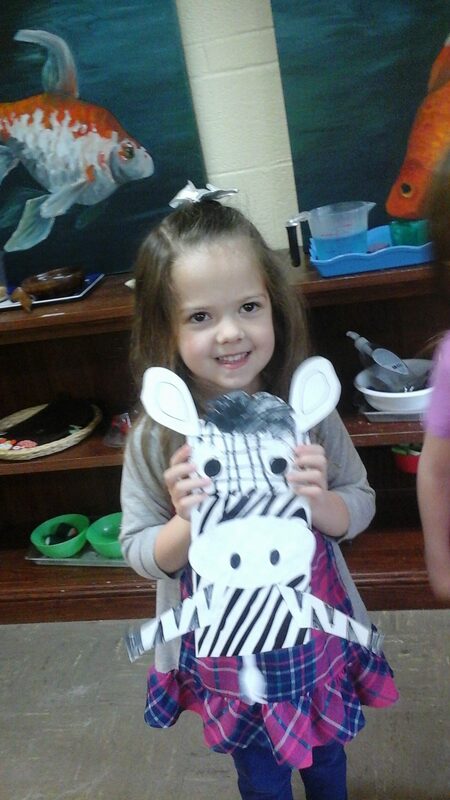 Making an African animal craft. Discuss how soccer is a very popular sport in Africa. 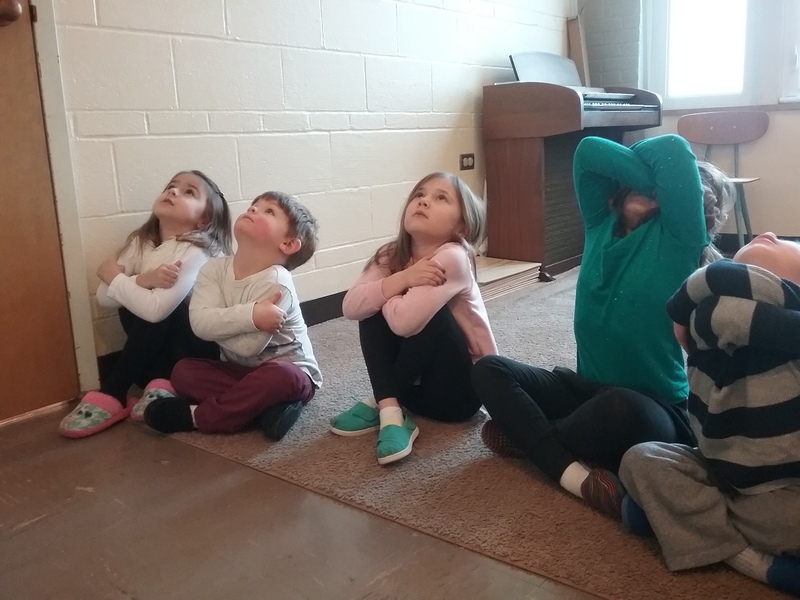 Learning all about the signs of Spring. Learning about the parts of the flower. What animals are born in the Spring? Try making a new recipe as a family from a country we’ve discussed in Africa. Discuss with your child their favorite animal that they learned about from Africa. Posted on March 9, 2017 at 7:23 pm. 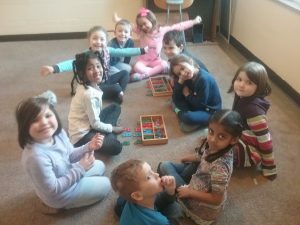 The month of February was very busy in our classroom! We learned about types of transportation, all about inventors, our Presidents (past and present), and all about dental health! 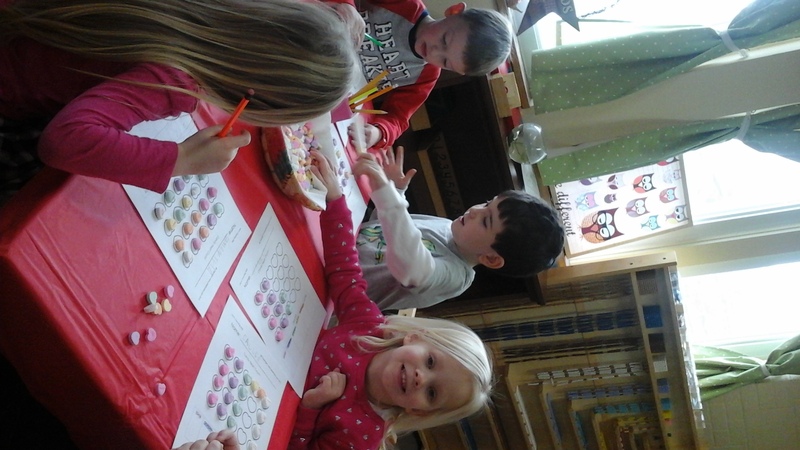 We also had fun celebrating Valentine’s Day! 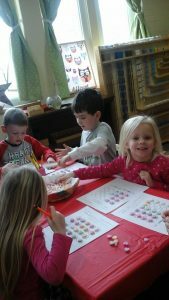 Our Valentines Party was a great success! 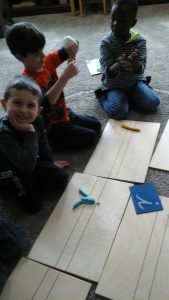 During the first week of February, we discussed trains, boats, buses, and trucks and other forms of transportation. The children enjoyed categorizing the types of transportation into those used to travel on land, air, and water. 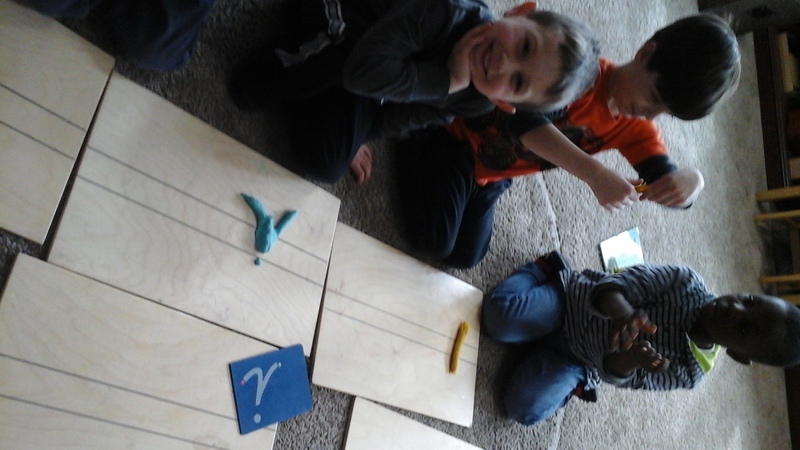 The children also enjoyed working on an initial sound train work with Ms. Kerri during our afternoon group time. We also took time to discuss what Groundhog Day means and made predictions whether the groundhog saw his shadow. Unfortunately, he saw his shadow, which we learned meant we were in for 6 more weeks of winter! 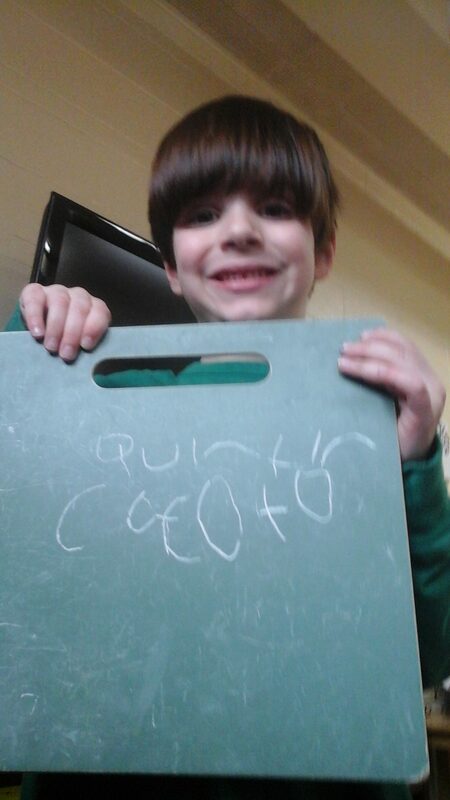 Quintin showing of his handwriting skills! 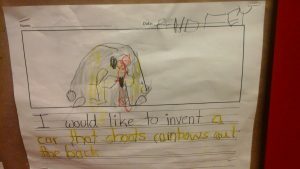 We learned about famous inventors during the second week of February. 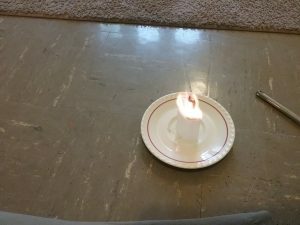 We learned how Thomas Edison invented the light bulb, how Benjamin Franklin discovered electricity, and how the Wright brothers invented the first airplane. The children also decided to come up with some of their own potential inventions, such as a “make-up machine” and a ” a washer that makes cats”. I love how creative my students are! 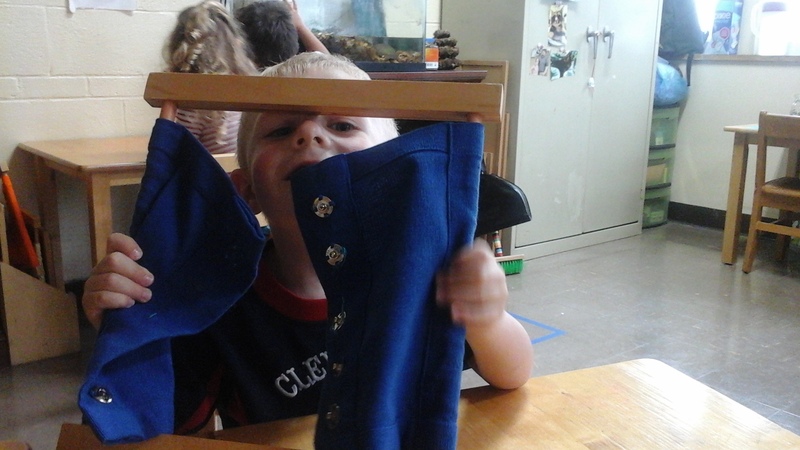 Victoria practicing clothes pinning in the practical life area! This material helps to develop the child’s pincer grip, which is indirect preparation for writing. 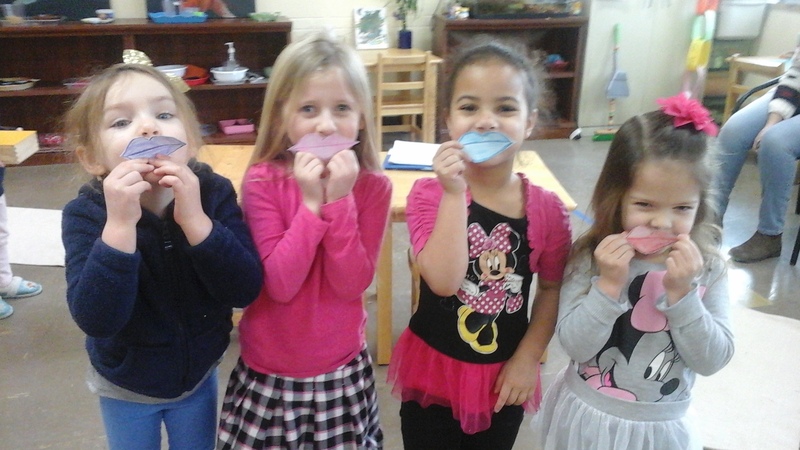 We learned all about dental health during the final week of February. We learned all about how when we are young, we only have twenty teeth when we are younger. Later, when we become adults, we have thirty-two teeth! 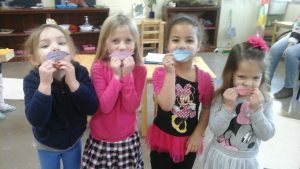 We also learned the proper way to brush our teeth and what foods are healthy for our teeth. Ms. Kerri had the children make a list of what foods were good for our teeth and what foods are not good for our teeth. 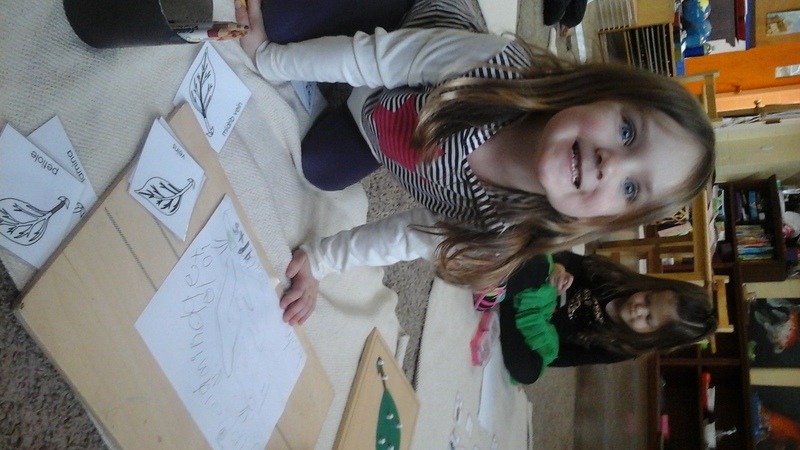 Maren tracing and labeling the Part of The Leaf Puzzle! Did you know puzzles indirectly prepare your child for reading? Please take time to practice with your child what they are learning here at school. Ask your child about their favorite President of the United States. 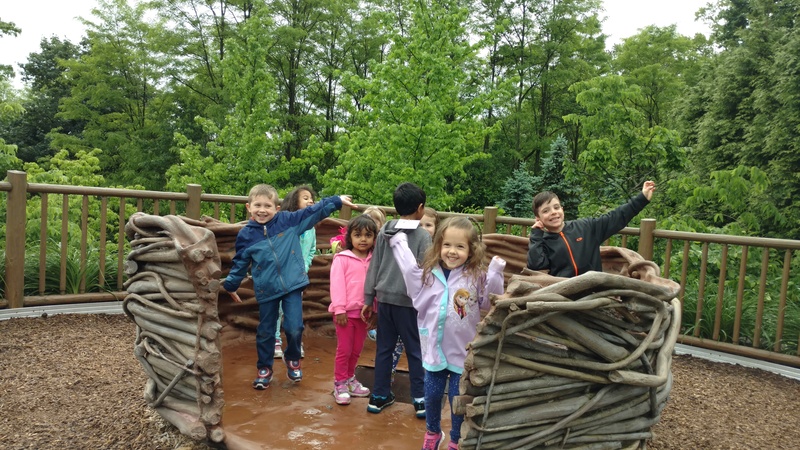 Take a trip to the zoo to visit some of the arctic animals, such as the polar bears and penguins, and discuss which one is their favorite and why. Practice good dental hygiene with your child by practicing brushing their teeth correctly with them. Take a trip on the Cuyahoga Valley Scenic Railroad together as a family. Samantha and Hali sharing quiet reading time together in the Library.